Activists, parents and first-time protesters motivated by accounts of children separated from their parents at the U.S.-Mexico border are rallying in cities and towns across North America today to protest the Trump administration’s immigration policies, calling for an end to the detention of immigrant families. 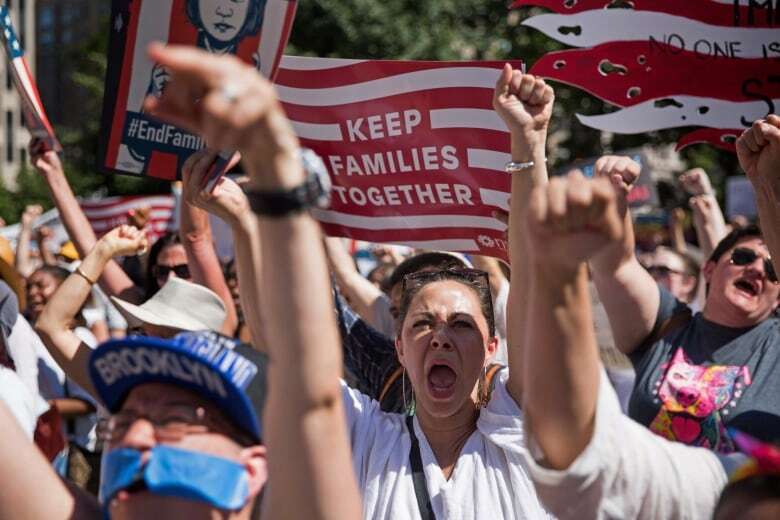 More than 700 planned marches drew hundreds of thousands of people across the country, from immigrant-friendly cities like New York and Los Angeles to conservative Appalachia and Indiana to the front lawn of a Border Patrol station in McAllen, Texas, near a detention centre where migrant children were being held in cages. There, people held American and Texas flags and signs depicting a migrant father, mother and child as the Holy Family with haloed heads travelling through the desert. Thousands dressed in white and gathered on Lafayette Square in Washington, across from the White House, with crowds chanting “Shame! Shame! Shame!” as speakers denounced the separation of children from their parents after they cross the U.S. border. 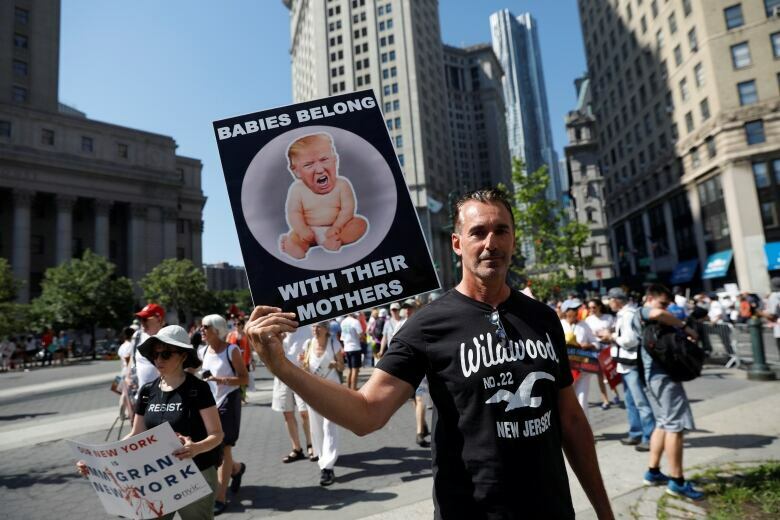 “The way they treat families, the way they treat immigrants — that’s not America,” protester Aneice Germain said of Donald Trump’s tough stance on immigration, a cornerstone of his 2016 election campaign and his presidency. Trump says illegal immigration fosters crime and he implemented a “zero tolerance” policy in May to prosecute all immigrants apprehended for entering illegally. That led to the separation of more than 2,000 children from their parents, causing an outcry this month, even from some allies of the Republican president. At the march in New York City, protesters chanted and sang as they gathered in sweltering heat at a Manhattan park before heading across the Brooklyn Bridge. “It’s important for this administration to know that these policies that rip apart families — that treat people as less than human, like they’re vermin — are not the way of God, they are not the law of love,” said the Rev. Julie Hoplamazian, an Episcopal priest marching in Brooklyn, whose own grandparents fled to the U.S. during the Armenian genocide. The protests grew several big names, including in L.A., where the assembled crowd was treated to a performance by singer John Legend. Some in the crowd spoke about how U.S. immigration policy has affected their own families. Smaller groups came together in city parks and downtown squares in every state, and photos quickly started ricocheting around social media. Among the targets of their censure: Trump, Attorney General Jeff Sessions and the agencies Immigration and Customs Enforcement and Customs and Border Protection. Protesters were due to march on the Justice Department building in Washington later in the afternoon. Crowds also gathered in downtown Albuquerque, New Mexico, with protesters voicing concerns about everything from abortion rights and the future makeup of the U.S. Supreme Court, to what, if any, influence Russia might have on American politics. Local resident Margarita Perez held up a small Mexican flag as speakers addressed the crowd. Accompanied by her daughter, she said she was concerned about the children who were being detained and for those parents who did not know where their children were taken. Albuquerque Mayor Tim Keller, a Democrat, told the crowd of his trip to the U.S.-Mexico border, where he said he and other mayors were denied a tour of a shelter at the Tornillo port of entry outside of El Paso, Texas. A protest was also held in Bedminster, N.J., where Trump is spending the weekend at a private golf course he owns in the community. More than a dozen rallies were also organized in Canada, in cities that include Halifax, Ottawa, Toronto, Winnipeg, Vancouver and Edmonton. In Toronto, a few hundred people gathered in front of the U.S. consulate, many bringing stuffed animals with them to represent the migrant children separated from their parents. Though many who were expected to show up at the U.S. rallies were seasoned anti-Trump demonstrators, others were new to immigration activism, including parents who say they feel compelled to show up after heart-wrenching accounts of children forcibly taken from their families as they crossed the border illegally. In Portland, Ore., for example, several stay-at-home moms organized their first rally while caring for young kids. “Honestly, I am blown away. I have literally never seen Americans show up for immigrants like this,” said Jess Morales Rocketto, political director at the National Domestic Workers Alliance, which represents nannies, housekeepers and caregivers, many of whom are immigrants. Tyler Houlton, a spokesperson for the U.S. Department of Homeland Security, welcomed interest in the immigration system and said only Congress has the power to change the law. Right-wing activists with the group Patriot Prayer also had a permit to march later on Saturday and the Portland Police Bureau said Friday there would be a heavy police presence.